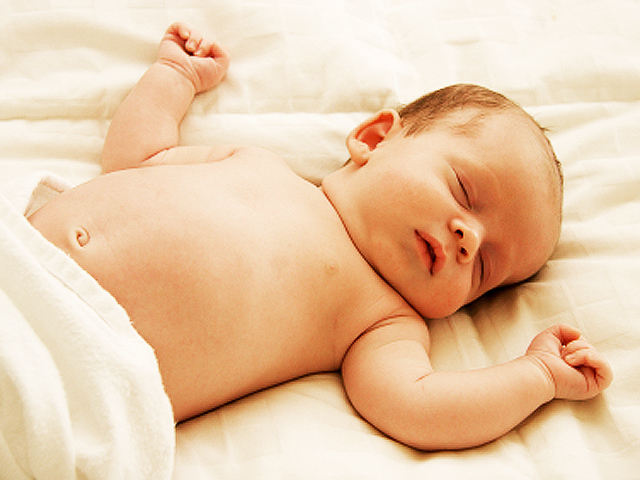 Infant sleep machines may be too loud, potentially damaging a baby's delicate hearing. New research shows that when played at maximum levels, some of these devices -- which play soothing sounds to help babies sleep -- could exceed the noise limit recommended for infants at hospital nurseries. Researchers tested 14 unnamed infant sleep machines that are commonly sold in the U.S. and Canada. They played 65 sounds at the maximum volume and tested them from three different distances: 30 centimeters (which is about the distance from the infant to the crib rail), 100 centimeters (placement near the crib) and 200 centimeters (across the room, or about 6.5 feet). All of the machines exceeded the 50-decibel (dBA) noise limit that hospitals adhere to at the 30- and 100-centimeter distances. Three devices reached levels greater than 85 dBA from the 30 centimeter placement. If played consistently for eight hours, those sounds are higher than the noise limits set by the National Institute for Occupational Safety and Health for adult workers. Only one machine did not go over the 50-dBA level at the 200 centimeter mark. "Unless parents are adequately warned of the danger, or the design of the machines by manufacturers is changed to be safer, then the potential for harm exists, and parents need to know about it," Dr. Gordon B. Hughes, the program director of clinical trials for the National Institute on Deafness and Other Communication Disorders who was not involved in the study, told the New York Times. Senior study author Dr. Blake Papsin, otolaryngologist-in-chief at the Hospital for Sick Children in Toronto, told USA Today that he was also concerned that white noise may harm a developing brain, since infants need to hear all sounds in order to help their brains mature. "Completely removing all informational content at a loud, potentially damaging level is the worst," he said. The study authors urged parents to lower the volume and move the machines more than 200 centimeters away from the infant to prevent hearing loss. Papsin added to the CBC that tougher safety standards might be needed since an infant's ears are more sensitive than a mature adult's. "When we modeled that in the calculations, we found that the estimates of sound pressure that we were using, the safety level might be underrepresented, because the ear canal of the baby actually might be more susceptible than the adult ear. So our safety levels are underestimates," he explained. The study was published March 3 in Pediatrics.